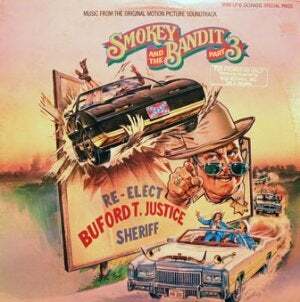 One of our favorite urban myths/conspiracy theories is that of Smokey And The Bandit III and the role Jackie Gleason played in it. The plot is as disorganized as a South Korean Parliament fight, but Sheriff Justice essentially bets his badge (at his retirement party, for some reason) against his ability to transport a fish. To make things even more confusing, Jerry Reed decides to transition from Snowman to actually playing the Bandit himself. This has all led to the conspiracy theory that they originally had Gleason play both the roles of the Bandit and the Sheriff but this confused test audiences and they put Snowman in the role of the Bandit. We just think the film is bad. However, it's a better theory than simply stating that union labor killed the American car, a point made by wojo90 and QOTD. What&apos;s The Best Union-Built Car? I have a feeling that there may be some union hating going on in this thread. While I don't think that they're entirely saintly, I can understand why they would do some things, like fight to keep cars made in America. GM, Ford, and Chrysler would have happily shipped out all of their production to Mexico and Japan much more and way sooner that they have without the UAW. Look at the electronics industry, there aren't any radios, televisions or iPods that are not made in China that are less than forty years old. Many people don't realize it, but the unions have probably boosted their salary in some way, too. Is there a chance that doctors would be paid as much as they are today without the UAW workers and their excellent health benefits? If you've ever worked at a minimum-wage job, you've felt the benefits of a union. Perhaps unions may have grown too big or too powerful in the recent years, but I still believe that they are basically a good thing. The core purpose of a union is to keep the workers from being abused, and paid fairly for their work, and having a better life. And that is what being an American is about. When graduating high school last year, I noticed that some of my classmates weren't really cut out for college. In today's world, a high school diploma isn't really worth much, and after graduation, it is either go to college and become a professional, or work the graveyard shift at Wal-Mart and live below the poverty line. And while I find myself doing the former, however, I still hate to see that happening. The blame for the decline of the American auto industry does not rest squarely on the shoulders of the UAW. The line worker only does as he is told, and builds what he is told to build. Blame the designers for forcing unattractive cars on the public. Blame the accountants for cost-cutting the cars into mediocrity. Blame the executives for mismanaging the companies for decades. But do not merely write it off as a union conspiracy. And so I say to Mr. Hardigree's question, since the Mustang and Corvette have been spoken for, the best union made car is the 1968-70 Dodge Charger. Uniquely American, with great style, power, and innovation.